I called my piece of art “Pray for Muslims” following whatever we had to see on Facebook after Paris terrorist attack on the 13th of November 2015. We all feel sorry about that bloody Friday that broke our hearts especially the ones who visited Paris before and they do have unforgettable memories over there. On the other hand, at that day I personally got offended seeing “Pray for Paris” everywhere while my country, Syria, is being bombed every day since five years. Over these five years, I did not see this much attention toward the people who are getting killed there with no mercy. Over these five years I did not see a lot of people posting about Syria and about the misery life Syrian people are living over there. This paper is dedicated to describe my piece of art “Pray for Muslims” explaining my ideas and thoughts about the influence of media on the Islamic world. The message behind the piece of art “Pray for Muslims” is to represent the contradiction of the global media whether its social or visual media. I personally believe that the global media is redirected to serve the desires of a selected class of people who really want to destroy the peaceful image of Muslims. This controversy starts with including all Muslim countries in the list of what is known as the “third world” countries which means the poor and backward countries; however, we can clearly see that most of the Muslim countries do have an acceptable, if not a good, economical level which other “first world” countries do not have. For the sack of this argument, let us assume that we are “third world” countries. Does not this mean that we need special care from the rest of the world? Is not this a part of the equality the world is pretending to follow? Equality does not only mean to treat all people in the same way instead, it means that we should treat each person according to his or her needs in order to ensure that all people are at the same level. “Pray for Muslims” piece of art represents how the global media focuses on the smallest terrorist attack that was POSSIBLY done by Muslims and pays a huge attention toward it, while on the other hand, hundreds of Muslims are getting killed every day in different regions either because of a terrorist attack or because of army forces bombing them. I am not saying that whatever happens in the western world is something easy, and I am not saying that the number of people getting killed over there is relatively small so I do not care; I am trying to deliver the message that the value of a human soul worth too much there compared to the value of a Muslim soul getting killed over here in the region. The global media is influencing the public opinion by focusing and exaggerating the news of 30 or 40 people getting killed in the western world, while on the other hand, the media barely focuses on the hundreds of people getting killed every day in Syria, Iraq, Palestine, Afghanistan, and other Muslim countries. Now while I am writing this paper on Microsoft Office Word I just realized that Islam and Muslims in not even a world in the dictionary of Microsoft Office. I believe this is an insult to Muslims and it is a shame for Humanity. describing the piece of art “Pray for Muslims”, the piece of art is a Photoshop picture that was created by taking some pictures from the internet and combining them all in one frame in order to deliver my message. The board is an A3 board (594mm X 420mm) and it was printed using the Matt technique. The reason behind choosing the Matt technique is that it provides a better visual representation especially for dark colors which were used intensively to represent the destructed building on the right side of the board. An A3 size was chosen to ensure the best quality in terms of printing to prevent any pixelated pictures. Concerning the colors choice, I intended to choose dark colors on the right side of the board to better represent the destruction and the misery lives Muslims are living in their countries. In addition, bright colors were used on the left side of the board to represent the luxurious life that does not really need to be focused on its limited needs. 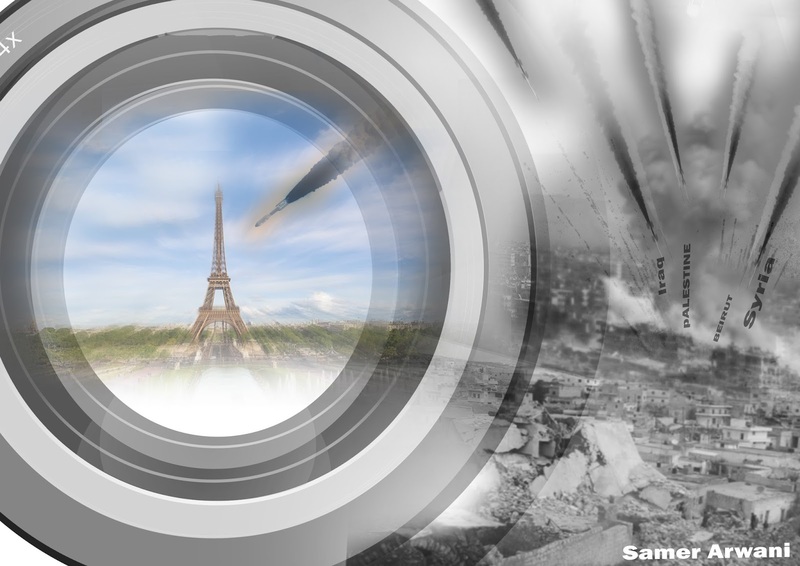 The left side also shows a camera lens showing how the global media is focusing on the single bomb coming toward the western world, while ignoring tens of bombs destroying cities on the right side of the board. Another message I tried to show is the fact that all the bombs in the picture (on the Eiffel tower and on the Buildings on the right side) are all coming from one direction which is the direction of the common enemy of the world who is the enemy of peace. Finally, I hope that the piece of art “Pray for Muslims” would make a difference and would make people look at the issue from a different perspective. I was asked to mention the artist who influenced me; however, I really had no one influencing me except Facebook pages that are full of pictures that can be of a great influence without us knowing. I do remember that I have seen something similar to my piece of art over the internet; however, I tried my best to look for it but I could not. I also was asked to write a short biography about myself and I would say: my name is Samer Arwani and I am a Civil Engineering Syrian Student who is studying at the American University in Dubai. I am Currently in my last year and I will be graduating in May 2016. My fields of interest include reading political and historical books and articles especially those related to my country Syria.